Schinus molle is native to Northern South America and Peru’s Andean deserts and Schinus terebinthifolius is native to Brazil. Pink peppercorns (rose baises) are not true peppercorns and are not related to black pepper. 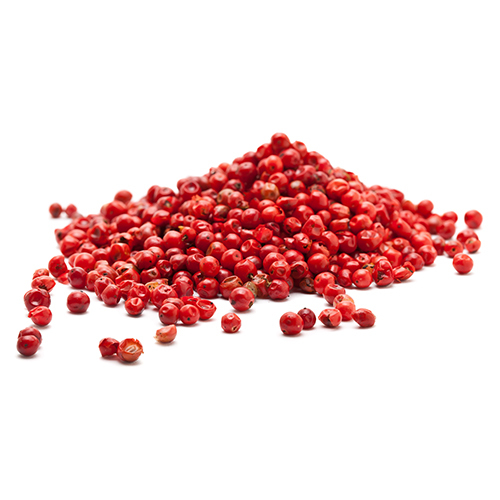 Pink peppercorns came to be called by that name because they resemble peppercorns, and have a peppery flavor. The fact that pink peppercorns are not true peppercorns is nowhere more apparent than in the flavor. Like black pepper, pink pepper does deliver heat; however, that heat lingers for longer than it does with black peppercorns. Pink pepper is slightly spicy, and has a typical sweet-resinous aroma. These fragile, fruity berries are not related to true pepper, but they have a sweet peppery taste that’s wonderful in cream sauces, seafood, and fruit. They are easily crushed to sprinkle onto finished dishes as a colorful garnish. epper, green pepper and pink pepper. It is often used to decorate dishes. Schinus molle is an evergreen tree that grows quickly to 25 to 40 feet in height. The trees seeds need to be kept slightly moist at all times during germination. Schinus molle produce clusters of red berries that encapsulate the seeds. It’s these red berries you’ll need to harvest to germinate the seeds. You’ll know it’s ready when the outer covering rubs off easily with your hands.